A walk along the river Wensum through Norwich. As a member of the Institute of Historic Building Conservation and the East Anglia Branch Committee, I have recently been involved in organising the IHBC Annual School for 2015, a three day conference which was held in Norwich at the end of June. I mentioned this at a meeting of the Northern Rivers Sub-Committee and in particular that I would be leading one of the tours at the conference which would explore the influence of the River Wensum in the development of Norwich, especially through the once thriving port. It was suggested that I should arrange a similar walk for the Broads Society committee members and on 4 June, 12 members of the Main, Northern and Southern Rivers Sub-Committees met outside the Norwich Playhouse to walk along the River Wensum as far as Carrow Bridge. This route of the riverside walk through the core of the city, is full of historic and architectural interest as a major tourist and visitor attraction. 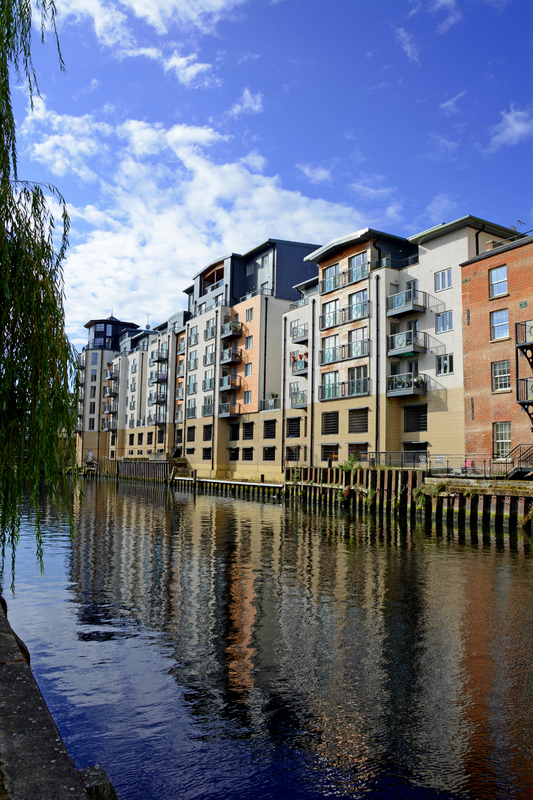 Back in 2007, the Norwich Society in conjunction with Norwich HEART (Heritage Economic and Regeneration Trust) published a document entitled ‘Wensum River Parkway – Norwich’s forgotten asset’, which sought to promote and raise awareness of the value of the river. 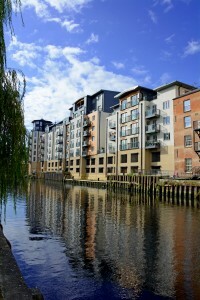 Although some work has been undertaken, such as encouraging the provision of public access to the river in new development, there are continuing concerns that the full potential of the river as a valuable asset to the city has not been fully realised and is not being adequately promoted. However, more recently, there has been further interest in the river with various organisations intending to work together to develop a strategy for its future. With this background information in mind, some of the key sites that we looked at along the riverside walk included the following :- Friars Quay : A development of 40 houses and 9 ground floor flats designed by Feilden & Mawson Architects and built in the mid 1970s on the site of the former Jewsons Timber Yard. This is an award winning scheme which featured in the Architectural Review where it was praised for its locally distinctive character and sense of historical continuity achieved through appropriate scale and form, layout, steeply pitched roofs, subtle use of colour and provision of semi-private space. Quayside : An attractive group of buildings with diverse architectural styles and materials from different periods including recent infill development and conversion of former school to residential use with interesting design of public realm and streetscape linking with the historic past. 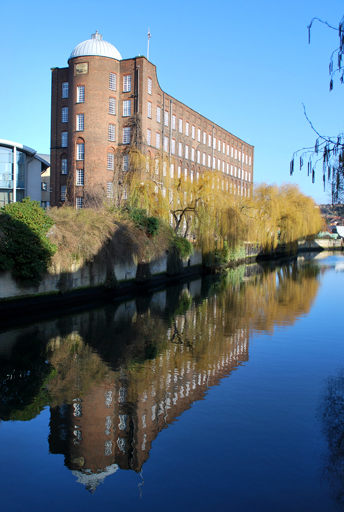 St James Mill : This Grade I listed Victorian Yarn Mill, built on a site originally occupied by the White Friars was central to the city’s industrial history. It was built between 1836-39 in response to the crisis in Norwich’s textile trade and was fitted with power looms to try and make the trade more efficient and lucrative. It has had a variety of uses including Caleys chocolate manufacturers for their box and cracker department in 1904 and in 1918 it was sold to become a Government Instructional Factory where those injured in the First World War were taught skills such as carpentry, bricklaying, plastering and tailoring to enable them to reintegrate into society. Today it houses Jarrolds headquarters and training centre along with a number of other businesses and the John Jarrold Printing Museum. Great Hospital Swan Pit : This Grade II listed mediaeval swan breeding pit in the Great Hospital Meadow is the only such structure left in the whole of the UK. Constructed in 1793 as a purpose built confined area, the swan pit contained the hospital’s cygnets, to be fattened on grain and sold. Cow Tower : Constructed of flint and clad with bricks, the tower was built as part of the city walls between 1294 and 1334 and then extensively rebuilt in 1390. It was one of the earliest purpose-built artillery blockhouses in England, which controlled a strategic point in Norwich’s city defences. Its height of almost 50 feet was necessary to overlook the high ground on the opposite bank and it housed guns and a garrison of gunners to defend the approach to the city across the River Wensum. Bishop Bridge : The only mediaeval bridge now surviving in Norwich. Built between 1337 and 1341 and constructed in stone, it formed part of the city’s defences and was originally topped with a fortified gatehouse as the main point of entry into Norwich from the east. Pulls Ferry.